St Helens winger Tommy Makinson is the eye-catching inclusion in England coach Wayne Bennett’s revised elite performance squad. Makinson is a new face in the squad along with his club-mate Alex Walmsley, who was a non-playing member of the squad for the recent international against Samoa in Sydney. Warrington have six players in the squad despite their disappointing season and leaders Castleford also have six representatives in a squad of 27 Super League-based players who will be in contention for the end-of-year World Cup in Australia and New Zealand. Bennett lost second rower Joe Greenwood from his initial 31-strong squad announced in January following his move from St Helens to Gold Coast Titans and he has now omitted Leroy Cudjoe (Huddersfield), Danny Houghton and Jamie Shaul (Hull), Kyle Amor and Matty Smith (St Helens), Brett Ferres (Leeds) and Sam Tomkins (Wigan). Eleven of the 27 are likely to miss out when Bennett names his final 24-man squad, with the eight NRL-based players likely to get the nod, but he insists others can still force their way into contention. Bennett said: “The total number of the squad has been reduced but that’s not to say that the door isn’t open. “Myself and staff are monitoring and watching players every week - we ask them to do their best for their club, improve as a player and work on the little things that will have a big difference come October. “The 13 Super League players that travelled over for the Samoa Test have been included again; I want them to share their experiences with other members of the squad. It was an extremely positive and productive camp which resulted in an impressive display. England have confirmed they will play a warm-up game in Perth - where the squad will be based pre-World Cup - against an Affiliated States side made up of players from Western Australia, Victoria, South Australia and the Northern Territory, at nib Stadium on Friday, October 20, a week before their opening game against Australia in Melbourne. 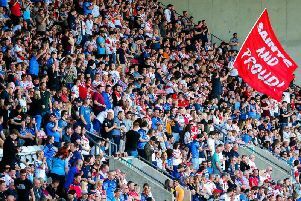 England elite performance squad: G Eden, L Gale, Z Hardaker, M McMeeken, P McShane, M Shenton (all Castleford), J McGillvary (Huddersfield), S Taylor (Hull), R Hall, S Ward, K Watkins (Leeds), J Lomax, T Makinson, M Percival, J Roby, A Walmsley (St Helens), K Brown, D Clark, M Cooper, B Currie, C Hill, S Ratchford (Warrington), J Bateman, J Burgess, L Farrell, S O’Loughlin, G Williams (Wigan).